With the continued popularity of Light Rock Fishing, it perplexed me that there are not more detailed guides on mini-fish species. Having spent all of 2016 species hunting, I wanted to put my own mini-guides out there for the intrepid LRF angler, starting with one of the biggest and, in most places, rarest rockpool predator. Gobius Cobitus – the giant goby, truly lives up to it’s name. Of all the inhabitants of the intertidal zone, few can rival this fish for size. Growing to nearly a foot long and weighing up to nine or ten ounces, it is the king of the rockpool. From an angling perspective it’s an intriguing target, with location being significantly more important than tactics when targeting them. A large male giant goby, in full breeding colours. These fish are plentiful around the Mediterranean and eastern Atlantic. The UK is at the northern most tip of their range so they are much rarer in our waters. Unfortunately, if you live further north than South Devon, you are going to be extremely lucky to find them. Though recently they were discovered in a rockpool survey near Newquay, so perhaps as our waters warm they will move northwards, like many species already have. For the species hunter or mini-species enthusiast who wishes to catch this sometimes very elusive fish, fishing on the south coast of Devon and Cornwall is a must. It takes a particular breed of angler to actively seek out such a fish, their habitat being predominately along rocky and sometimes dangerous coastline. I often find the best giant goby rockpools whilst out targeting wrasse or bass, they share the same habitats and bringing an LRF set-up with you can prove great fun, especially if the larger fish are not playing ball! I tempted this goby from a tiny rockpool, having unexpectedly spotted movement in the corner of my eye. As you clamber across rocks from gulley to gulley you will come across rockpools. The average angler might ignore these but very often they can hide giants. If you are loud or clumsy you will often see splashes or ripples caused by spooked fish, shooting back under the nearest rock or boulder. If you are tactical and quiet, keeping a low profile, these fish can prove quite bold. A small lure – and I really mean any small lure that can be worked effectively in shallow water – slowly pulled seductively near a crevice can result in a ferocious take! 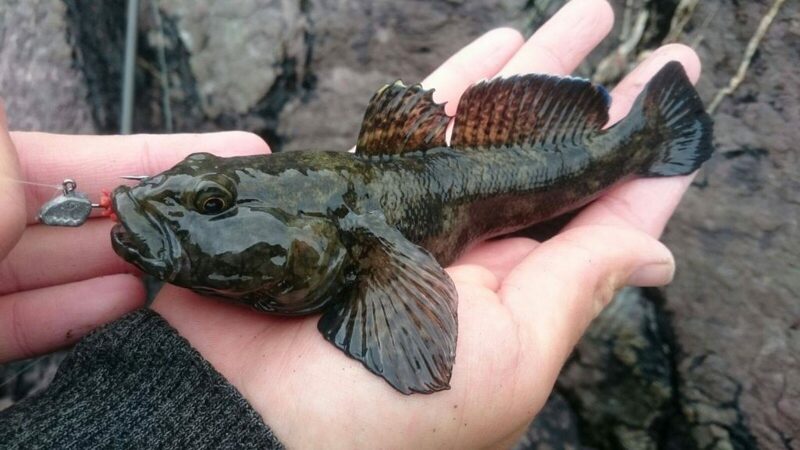 Giant gobies are not shy biters if they don’t feel threatened. Many times I have had two or three attempting to take the lure, fighting amongst themselves, with the largest normally winning the prize. A more typically coloured giant, refusing to let go of the lure! Not every rockpool will hold fish, but if you find one goby then there will undoubtedly be others. You can easily lose an hour trying to tempt the largest fish in the rockpool. The ideal pool will be around a foot deep and be full of small boulders and crevices. The fish need to feel comfortable in order to make it a home. Don’t ignore the rockpools that are further up the rock-face and look lifeless, if they have an inlet of water (be that salt or fresh) they will quite often surprise you, especially if the weather has been particularly rough. Giant gobies will of course live in deeper water too, though I find this an inefficient place to specifically target them, with wrasse or pollack being much more likely to take your lure first. Another male fish, who fell for the classic two inches of Isome on a jig head trick. Lure selection is by far the easiest part of trophy goby hunting. When they are confident they will take almost anything. I found my first goby by casually flashing a metal shore jig in a likely rock pool, the fish shot out and hit it. I quickly changed to a more suitable size eight jig head with Isome to land it, yet I could have realistically caught it on the jig if I had persisted and know others who have. These fish have big mouths and will hunt anything that has the misfortune to swim into their path. Small Fiiish Black Minnows and crab imitation lures are well within the feeding ability of the larger specimens. Though for the best success I prefer lures no larger than two inches, with scented or flavoured just slightly outperforming unscented lures. Four of the most common gobies in comparison. 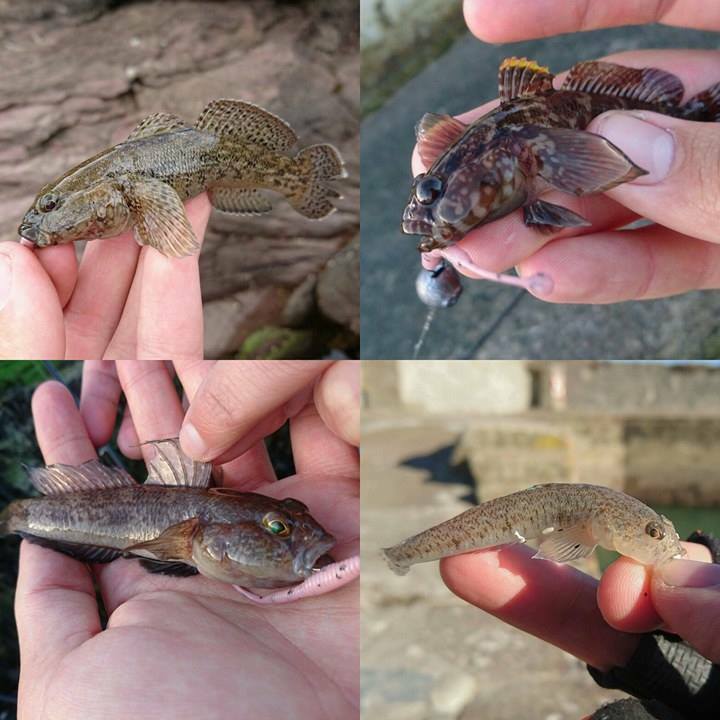 clockwise from the top left – giant goby, rock goby, sand goby and black goby. One of the trickier aspects of species hunting, especially when targeting gobies, is identification. Gobies are notoriously tricky but giants are fairly simple to identify. Firstly even small giant gobies are much broader and round in profile than their cousins. They also have much smaller eyes in relation to their heads. Their colouration ranges from light brown to nearly jet black but will always have a ‘salt and pepper’ speckling across them. In the breeding season, which appears to be in late winter/early spring, some males turn very dark and develop a beautiful blue edge to their rear fins, if you look closely you will see faint blue stripes around dark spots in their dorsal fin. They really are a stunning fish to look at. 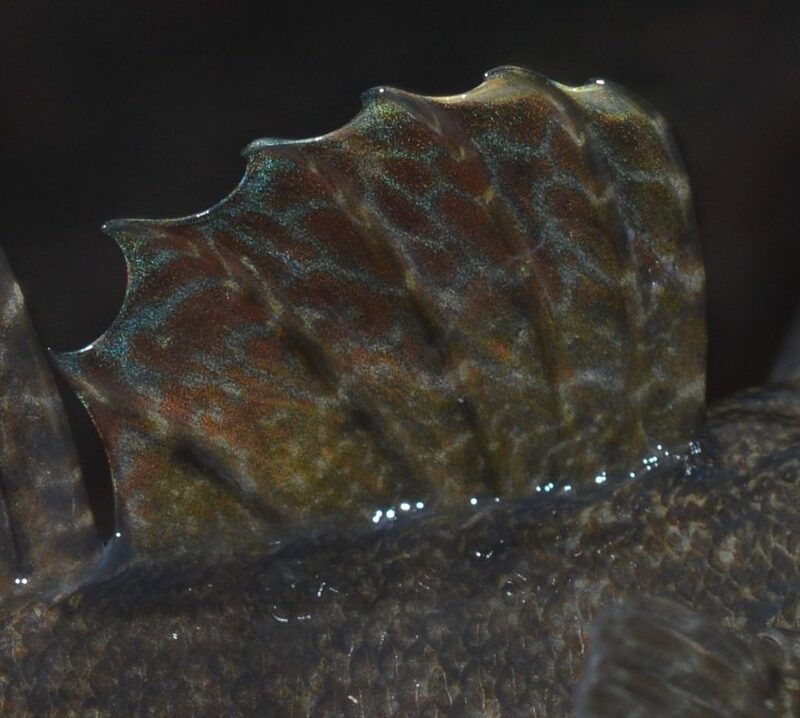 Detail of the intricate markings on the male’s dorsal fin. 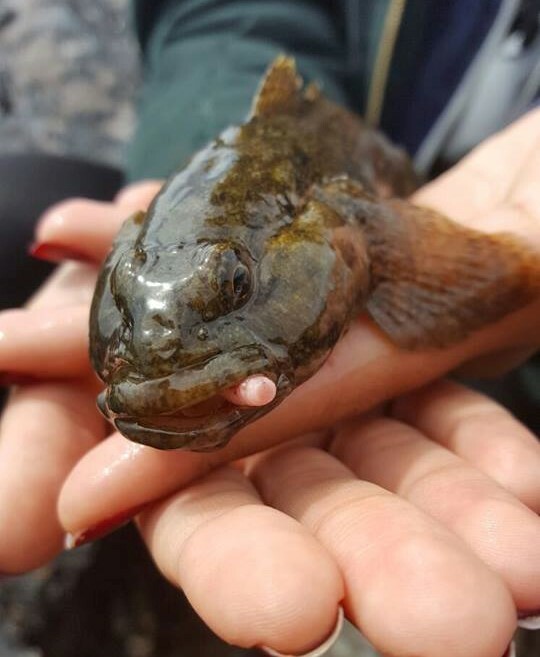 It’s crucially important you practice catch and release with giant gobies. Firstly, they are protected by law and it is a felony to kill or take one. Secondly, being such a rarity in British waters by a whole, it’s our duty to be responsible when targeting them. Since they are a rockpool inhabitant, they are a tough species and with gentle handling they swim away strong, with only a bruised ego for their troubles. 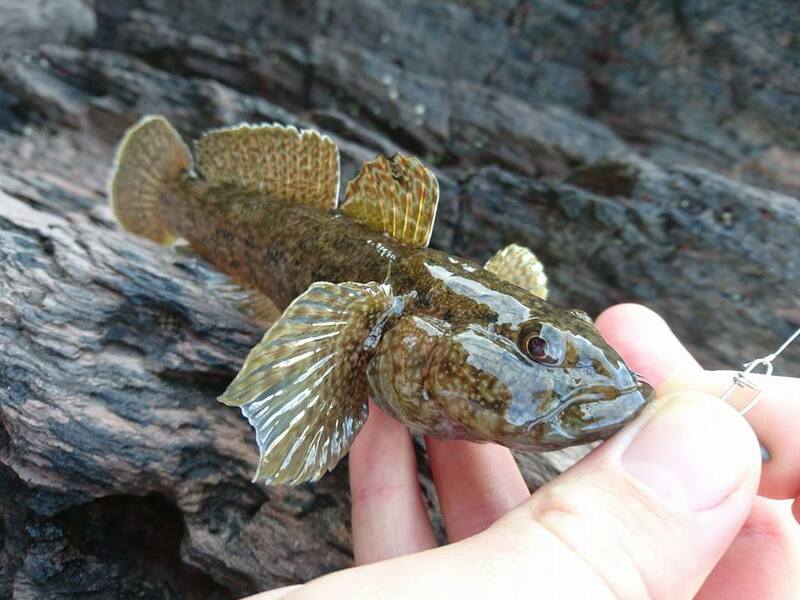 3 Responses to "LRF Profile – The Giant Goby"
Had one of these while fishing off the stone pier at Weymouth, it stretched from my fingertip to my wrist, wasn’t sure what type of gobie it was, now I know, thanks for the article. I was bass lure fishing last autumn when a guy turned up to do a bit of general bait fishing. He had three of these – absolute clonkers – serious sized fish. I could not believe the size of them and he didn’t know what they were. Protected under Schedule 5 of the Wildlife and Countryside Act 1981, I really don’t think you should be targeting this fish.